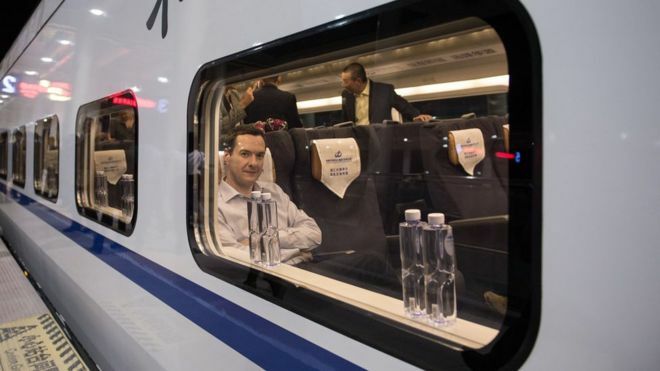 24 September, 2015: BBC News reported that George Osborne is urging Chinese firms to pitch for £11.8bn in construction contracts for the UK’s proposed HS2 rail line, during his recent visit to China. On the same day, The Guardian reported that Osborne was to invite competition for bids at an event in Chengdu – to attract Chinese investors to back HS2 and other major UK rail infrastructure projects, particularly across the north of England. Osborne has waxed positively about “entering a golden era of cooperation” between the two countries, and the crucial need for businesses and communities from across the UK to gain benefits by forging closer economic ties with China. Osborne appears keen to gain investment in infrastructure projects for his Northern powerhouse plan – despite recent contradictory remarks about the pausing of major rail projects in the north. Is this potential Chinese involvement an arrangement that a nation, that pioneered railways, should be contemplating and welcoming? PhD in Computing; BSc (Hons) Information Systems Design. Lecturer in Advanced Database Systems and Database Administration.